Born in 1996, Mindy Chen, a six grader from Fremont, California, is currently a scholarship student at the Preparatory Division of San Francisco Conservatory of Music. She started playing the violin at the age of four, made her first concert appearance in the same year, and won her first violin competition at the age of seven. In the following years, Mindy took top honors in a number of music competitions. She received the James Denver Gary Instrumental Award of the Pacific Musical Society in 2004, 1st place in the Junior Solo String Competition sponsored by the Music Teachers’ Association of California in 2005, won the Palo Alto Philharmonic Concerto Competition, and 1st place in the Oakland East Bay Young Artist Concerto Competition in 2006. In June, 2007, Mindy won the Grand Prize of the 1st Stradivarius International Violin Competition Youth Category in Salt Lake City, Utah. She was then invited to perform as a soloist at the Gina Bachauer International Piano Festival and the 2007 Intermountain Suzuki String Institute. Mindy has performed on the National Public Radio show “From the Top”, which celebrates gifted young classical musicians in the United States. She also appeared on NBC’s Tonight Show with Jay Leno as one of the kids with special talents in America. Her concert experience includes recitals at the San Francisco Conservatory of Music, Solo performances at the US Open Piano Competition Winners’ Recital, Steinway Society Young Artists Concert, and other private musical events. She played the 1st movement of Paganini’s Violin Concerto No. 1 in D major with the Oakland East Bay Orchestra conducted by the Music Director Michael Morgan, and the 3rd movement of Bruch’s Violin Concerto No. 1 in G minor with the Palo Alto Philharmonic. 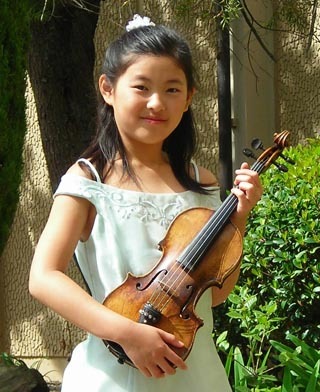 As the youngest prize winner, Mindy won 3rd place in the Menuhin International Violin Competition held in Cardiff, UK in April, 2008. Her upcoming engagements include performing as a soloist with the Salt Lake Symphony in their 2008-2009 Season. Mindy has been studying with Mr. Li Lin, a violin faculty member of the Preparatory Division of the San Francisco Conservatory of Music since 2001. She has also studied and worked with renowned artists and pedagogues such as Victor Danchenko, Ian Swensen, Paul Hersh, Elizabeth Blumenstock, and Bin Wang through private and/or master classes. From October 2008 Mindy will study with Prof. Zakhar Bron at Cologne University of Music, Germany. Besides playing the violin, Mindy has many other interests, including listening to and singing pop songs, reading fantasy books, surfing the internet, watching TV, shopping, chatting with her wide circle of friends.